Pick a Republican with enough working digits to handle a pen…to sign the legislation that has already been prepared. Thus far, Trump and his henchmen have conducted a full-frontal assault on civil liberties, open government and religious freedom, as well as instigating or condoning a cascade of ethics violations ranging from the serious (business conflicts of interests) to the absurd (attacking a department store for dropping his daughter’s fashion line)…In a hopeful note, Republicans are speaking out, but the list is short. Chuck Schumer, the Senate’s top Democrat, with John McCain. 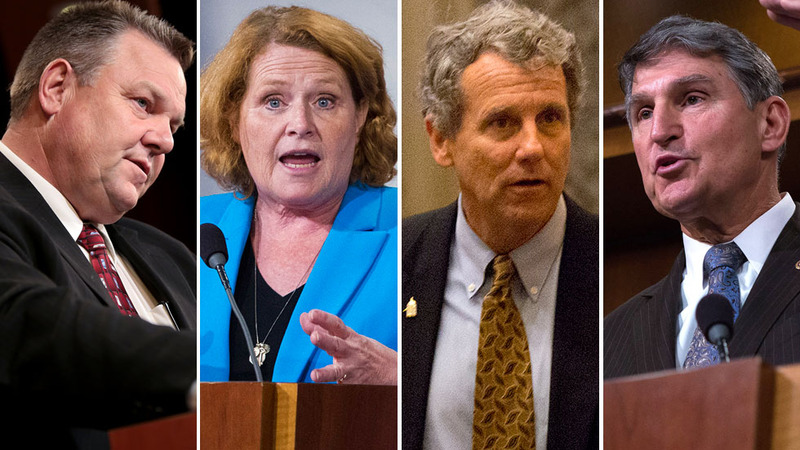 Will Schumer, the consummate deal-maker, hold his caucus together? 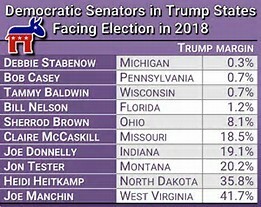 At present, there is no doubt that Kathleen Parker’s list is indeed short…much, much shorter than before the election, when #NeverTrump Republicans were at full throttle. The reason for this has a lot to do with the first quote by Grover Norquist. Thwarted for eight years by President Obama’s veto pen, the Republican majority in Congress finally has its man. 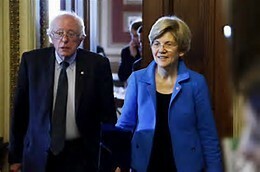 Yes, they hem and haw at Trump’s foibles, and often change the subject when presented with Trump’s latest Twitter horror. The point is, until there’s a tipping point after which a Trump administration becomes an infectious disease, Republican legislators see an obvious opportunity to enact their wealthy-donor-based agenda. 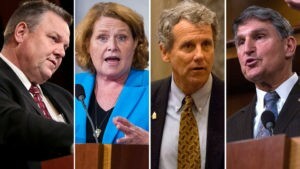 Democratic Senators Jon Tester Heidi Heitkamp, Sherrod Brown & Joe Manchin. All four will face voters in 2018. 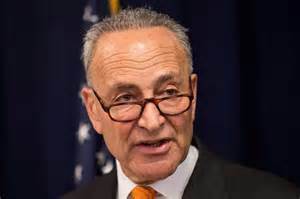 It starts with Minority leader Chuck Schumer (D-NY) to stymie the Republican advance. He saw with his own eyes the Republican obstruction of President Obama: threats of government shutdowns, the fiscal cliffs and debt defaults. He no doubt understands the Democrats’ penchant for governing might lead to compromising with Republicans, who don’t even pretend to care about good government. On the other hand, he must see that the Democratic base is outraged, and will have none of it. No compromise. No cooperation. Schumer and his 47 Democratic colleagues (two independents caucus with the Democrats) do have some procedural arrows in their quiver. The United States Senate has archaic but important rules designed to empower the minority…”the saucer that cools the teacup of popular opinion.” But it works only if the caucus sticks together (Schumer has memorized all 47 cell phone numbers). McConnell can ask for consent at any time, and so that’s why there must be at least one Democrat on the Senate floor at all times. 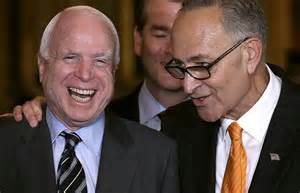 Seeking cloture requires the support of 60 senators. So as long as 41 Democrats stick together, they make it harder for Republicans to pass legislation. Democrats can also offer unrelated amendments to bills under debate that can force Republicans to take sides against each other or against the White House. For example, in debating Wall Street deregulation, throw in an amendment that imposes more sanctions on Russia. McConnell can block votes those amendments only if he reciprocates with Republican amendments, so it’s likely that some bills might emerge that force GOP senators to cast unpopular votes. 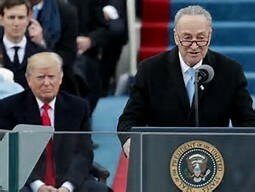 With 48 members and the reality that it usually takes 60 votes for bills to clear the Senate, Chuck Schumer is the most important Democrat in Washington. And the Senator from New York has the ultimate cover from charges of obstruction: the lingering stench of illegitimacy of the Trump presidency. That can only get worse. Of course none of this could happen without the supremely righteous public outcry over the fiasco happening at the highest levels of our government. The marches and local actions are great and are having an impact. I want to call your attention to living document created by The Indivisible Team, a group of former congressional staffers. The have published Indivisible: A Practical Guide for Resisting the Trump Agenda. It give precise guidance on how to influence your elected officials both nationally and locally. If your state is listed (mine is), let’s get to work.